Liner replacements typically start at $3,000. See our website for more detail. GTA'S Most Premier Pool Builder. Stop By Our Two Show Rooms! We have been dealing with the retail store for more than 15 years. 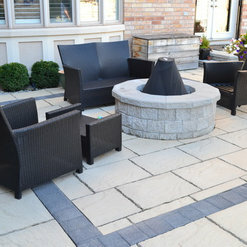 We have always found the staff extremely knowledgeable, helpful and friendly. Mary Lou in particular is excellent and has always gone above and beyond in every situation. 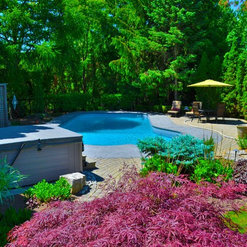 We would highly recommend this store for all your pool and spa needs. The Retail Store is super! I get all my products from here, and find the staff so friendly and helpful! Marilou does an amazing job!! We had a renovation of our pool completed in 2014 and converted to a Low Salt System which we are extremely happy with. The Team that was assigned to us was knowledgable and provided us with regular updates. We purchase our annual chemicals from Jameson and have our pool water tested on a bi-weekly bases. Thank you for your many years of service. 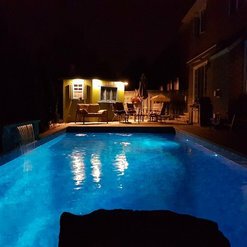 Our family bought a home with a pool and soon discovered that it needed a lot of upgrades. The liner and the filter and the pump were are replaced, not all at once, but over the years. We got a new pool cleaner and replaced our brominator with a salt system. 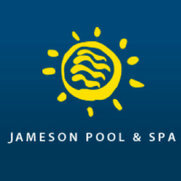 Jameson opens and closes our pool each year and takes very good care of us. We are proud to recommend their business and the caring professionals who work there. We've dealt with your company in the past and always had a good experience; however, this year we were less impressed overall. Appointments did not always happen as we had been advised. Further, this year we used you for weekly cleaning. Although the fellow doing the cleaning was nice & professional overall, the service was not the best. In past, we've used another company and all we had to worry about was swimming. This year, the chemicals were off every time we tested the water on our own (using test strips) and, in fact, this week our pool looks like a swamp...algae seems to be building up likely because chemicals are off. We hired you as we've struggled in the past to manage chemicals. Unfortunately, we are less than impressed. Everyone that was involved with helping me to replace my liner were fantastic...friendly, efficient and knowledgeable. Have absolutely no hesitation in recommending them to friends or using them again. Thanks to everyone. 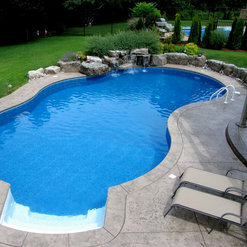 Commented: Pool type and Installation ChallengesThis is a gunite/vinyl pool approx 24x12'. 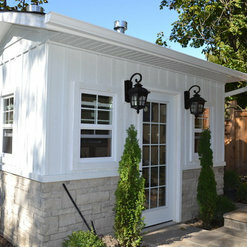 There is approximately 6' to the back fence, 15' to the cabana/bbq side and 10' on the near side. An efficient use of space.